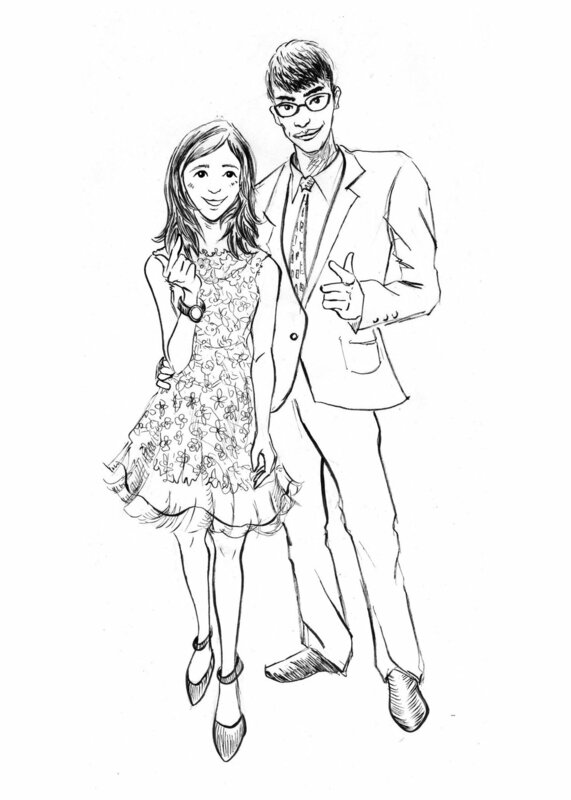 A friend of mine from high school is getting married this month, I couldn't attend her wedding in Taiwan because of my schedule, so I decided to offer her a wedding portrait. The artwork will be at her wedding on behalf of me. Below are the steps from start to finish. This is the finished line work based on their photo. Lala wants a longer hair look so I adjusted to her need. It's done with Sakura's fine brush pen. I really love their micron pens and brush pens. And this is the color sketch. I scanned and transferred the drawing into Procreate then colored it. I love the combination of traditional and digital medium. Above are the added background versions, they chose the one on the right. And finally, the finished painting/drawing! It's done majorly in ink and acrylic ink, touch of watercolor and Sharpie's markers on 11"x14" clay board. I love the smooth surface and shiny finish. This is my third time to draw on clay board. I plan to do a lot more in the future. Over the Winter break, I got to know Jen through our mutual friend Ann. Jen is an interior designer who also lives in Forest Hills (actually just 7 minutes from me!). She commissioned me to do a wedding portrait of her and her husband Peter as a Valentine's Day gift. I was very pleased to work with Jen for her caring personality, appreciation for art and understanding of the commissioned art business. The 1st color sketch. Jen wants to have a romantic and fairy-tale like vibe, so I used roses in the background and keep the colors subdued to achieve the tranquil feeling and to avoid the over-excitement. The 2nd and final color sketch. I added the blue and violet colors and changed the pink to orange to have a little contrast. Above 2 are the alternative sketches. I tend to do sketches digitally for faster and more convenient changes, but the final is ink washed. I enjoy meeting and working with people like-minded and sometimes even become friends with. In a fast-paced world like now, such connections are precious to me. My sister adopted two cats Jojo and Athena last year after our old cat Momo died for breast cancer. We had Momo since she was a kitten, so her death was really traumatizing to our family. My sister, especially, couldn't stand the missing feeling of Momo at home. Not long after she brought two cats back. Hi guys, I know I haven't been posting for like forever, so I don't know how may readers I have left out there. If you're reading this now, I appreciate you stopping by =) I'll pick my blogging up this Summer so you can hear more from me! So allow me to introduce you to the portrait of Hannah! Hannah is a 13-year-old guide dog of a senior couple who I visit weekly. I mixed quite a lot of molding paste with the acrylic to leave the thick brush strokes on canvas so Michele and Eva can feel it. Michele, the owner said he wants to take the painting to the grave when he passed away. I did this painting for free just for them. Once in a while I like to give back to the people I care. What do you think of this painting? Do you have a pet/family that you cherish so much?